Trading on the Trinidad Stock Exchange ended with 14 securities changing hands of which 4 advanced, 3 declined and 7 traded firm with a total of 327,664 units, valued at $1,721,615. There were 2 stocks closing at 52 weeks’ high and 2 at 52 weeks’ low at the close. At the close of the market, the Composite Index lost 0.40 points to close at 1,151.09, the All T&T Index fell by just 1.14 points to close at 1,985.29 and the Cross Listed Index increased by a mere 0.04 points to end at 41.49. Gains| Stocks increasing in price at the close are, National Commercial Bank with 100,200 shares traded valued at $117,231, closed with the gain of a cent at $1.17. 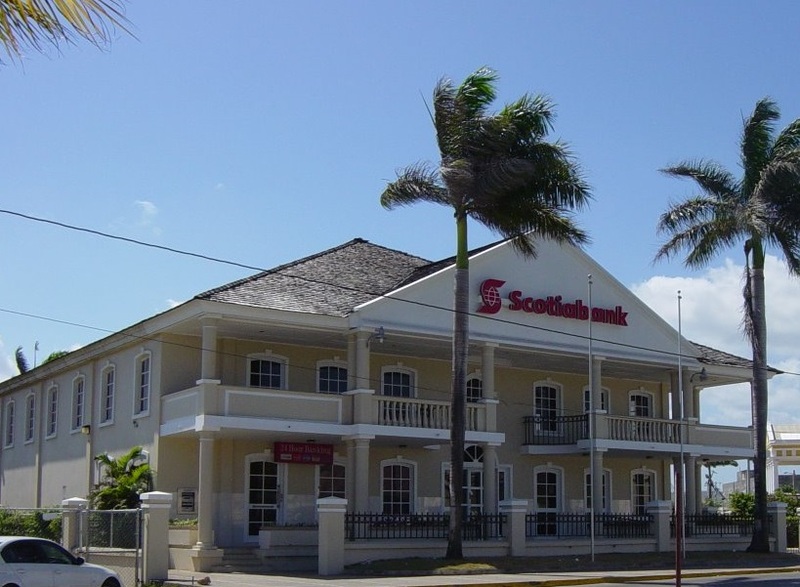 Scotiabank closed with 821 shares traded, 1 cent higher at $62.01, Unilever Caribbean with 400 shares trading, gained 1 cent to close at $65.01, a new 52 weeks’ high and West Indian Tobacco increased 5 cents to $121.42 while trading 1,200 shares to hit a new 52 weeks’ high. Declines| The stocks declining at the end of trading are, National Enterprises trading 250 shares closed with a loss of 2 cents at $17.37, a new 52 weeks’ low. Sagicor Financial Corporation traded 5,750 shares and closed with a loss of 3 cents at $5.49 for a new 52 weeks’ low and Trinidad Cement contributed 50,000 shares with a value of $115,000 to close at $2.30, down 20 cents. Firm Trades| Stocks closing with prices unchanged at the end of trading are, ANSA Mcal trading 688 shares at $66.52. 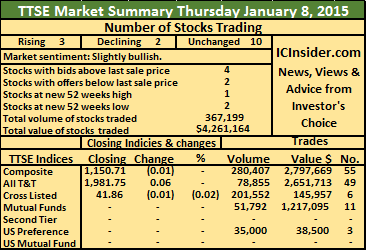 Berger Paints Trinidad closed with 300 shares trading at $3.65, Clico Investment Fund traded 8,520 shares valued at $200,215 and closed at $23.50, while First Citizens Bank added 24,920 shares valued at $909,579 to close at $36.50. Grace Kennedy ended trading with 288 units at $3.66, Guardian Holdings traded 1,200 units and closed at $13.26 and Jamaica Money Market Brokers closed with 133,127 shares changing hands at 43 cents. IC bid-offer Indicator| At the end of trading the Investor’s Choice bid-offer indicator had 3 stocks with the bid higher than their last selling prices and 5 stocks with offers that were lower. Is TTSE sensing economic problems? At the close of trading on the Trinidad Stock Exchange on Friday, there were more stocks being offered for sale below their last selling prices than those that had bids higher than the last prices, the gap is relatively wide, reflecting negative market sentiments. This is one of, if not the worst reading this data is showing, since its tracking by IC insider.com. Is this an indication that investors are starting to sense problems down the road for the Trinidad economy, with the price of oil and gas having collapsed? 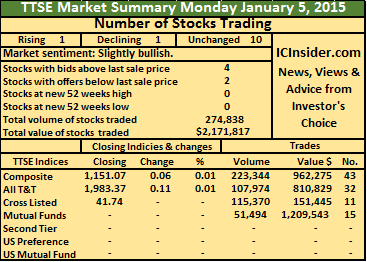 At the market’s close, there were 16 securities that changed hands, 3 advanced, 2 declined and 11 traded firm, with a total of 123,245 units, valued at $2,890,199 trading. The Composite Index rose 0.49 points to close at 1,151.20, the All T&T Index rose by 0.98 points to close at 1,982.73 and the Cross Listed Index remained at 41.86. Gains| Stocks increasing in price at the close are, National Flour Mills ended with 2,960 units trading, at $1.20 for 1 cent gain, Scotiabank gained 25 cents to end the day at $62.25 as it traded 1,175 units, Unilever Caribbean traded only 100 shares but gained 6 cents to end at $64.57, a new 52 weeks’ high. Declines| The stocks declining at the end of trading are, First Citizens Bank traded 2,346 shares to close with the loss of 1 cent at $37.64 and Massy Holdings with a volume of 5,902 shares being traded for $402,491 to close 3 cent lower at $68.18. Firm Trades| Stocks closing with prices unchanged at the end of trading are, Angostura Holdings with 200 shares closed at $14, ANSA Mcal closed at $66.51 after trading 1,060 units, Clico Investment Fund traded 30,072 shares valued at $706,435 and declined by 1 cent to end at $23.50. Firstcaribbean International Bank traded 500 units at $5, Guardian Holdings trading 1,270 shares at $13.25. Guardian Media closed at $19.75 with 1,100 shares changing hands, Jamaica Money Market Brokers contributed 4,406 shares in trading at 44 cents. National Commercial Bank ended trading with just 1,000 shares at $1.17, One Caribbean Media with 67,669 shares changing hands for a value of $1,488,721 to close at $22, Point Lisas Industrial Port with 300 shares changing hands closed with at $3.75 while Scotia Investments added 3,185 shares at $1.45. IC bid-offer Indicator| At the end of trading the Investor’s Choice bid-offer indicator had 3 stocks with the bid higher than their last selling prices and 7 stocks with offers that were lower. These numbers contrast with 4 to 2 on Thursday. Trading on the Trinidad Stock Exchange ended with 15 securities changing hands of which 3 advanced, 2 declined and 10 traded firm with a total of 367,199 units, valued at $4,261,164. At the close of the market, the Composite Index lost 0.01 points to close at 1,150.71, the All T&T Index rose by just 0.06 points to close at 1,981.75 and the Cross Listed Index fell 0.01 points to end at 41.86. Gains| Stocks increasing in price at the close are, Agostini’s in trading 100 shares to close with a gain of 1 cent, at $17.51. ANSA Mcal advancing 1 cent to end at $66.51 while trading 100 units and Ansa Merchant Bank that gained 1 cent to end at $39.46 with 100 shares changing hands, and ended at a new 52 weeks’ high. 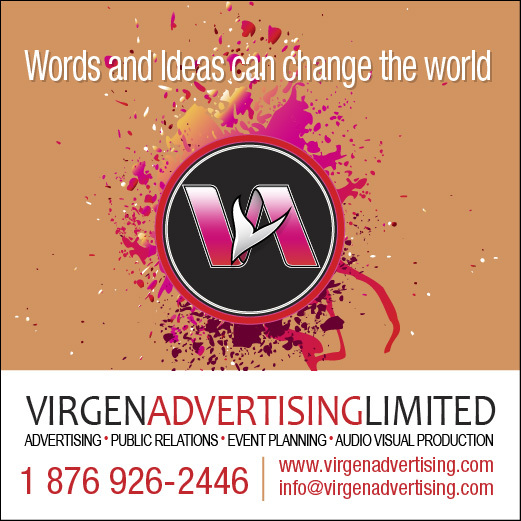 Declines| The stocks declining at the end of trading are, Flavorite Foods lost 30 cents to close at $4.50 with 1,000 shares changing hands and Sagicor Financial Corporation traded 7,935 shares valued at to close with a loss of 1 cent at $5.94, both shares closed at new 52 weeks’ lows. Firm Trades| Stocks closing with prices unchanged at the end of trading are, Clico Investment Fund was the with 51,792 shares valued at $1,217,095 remained at $23.50, First Citizens Bank with 62,665 shares traded with a value of $2,302,969 ended at $36.75, Guardian Holdings traded 331 units to close at $13.25. 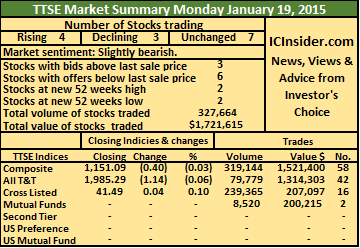 Jamaica Money Market Brokers with 172,580 shares changing hands closed at 43 cents, National Commercial Bank contributed 21,037 shares at $1.17, National Flour Mills ended at $1.19 while trading 1,760 shares, One Caribbean Media added 9,999 shares valued at $219,978 to end at $22. Prestige Holdings with 1,300 shares traded ended at $9.56, Sagicor Financial Corporation 6.5% US$ preference share traded 35,000 units at US$1.10 and Scotiabank contributed 1,500 shares with the price closing, unchanged at $62. IC bid-offer Indicator| At the end of trading the Investor’s Choice bid-offer indicator had 5 stocks with the bid higher than their last selling prices and 3 stocks with offers that were lower. Trading on the Trinidad Stock Exchange ended with 15 securities changing hands of which 3 advanced, 5 declined and 7 traded firm with a total of 913,172 units, valued at $7,801,572. One Caribbean Media suffered a loss of $3 with the price closing at $22. At the close of the market, the Composite Index lost 1.39 points to close at 1,150.72, the All T&T Index fell by 3.54 points to close at 1,981.69 and the Cross Listed Index increased by a mere 0.10 points to end at 41.87. Gains| Stocks increasing in price at the close of the market are, Angostura Holdings that gained 50 cents to end at a new 52 weeks’ high of $14 while trading 10,000 shares. National Commercial Bank with 492,632 shares changing hands for a value of $576,379, gained 1 cent to $1.16 and National Flour Mills traded 22,000 shares to end with a gain of 1 cent at $1.19. Declines| The stocks declining at the end of trading are, First Citizens Bank with 161,505 shares traded valued at $5,935,596, but the price lost 28 cents to end at $36.75, Guardian Holdings with 13,950 shares traded at $13.25, closed down a cent, Jamaica Money Market Brokers contributed 113,632 shares to close a cent lower at 43 cents. Massy Holdings traded 5,120 shares valued at $349,235 to close with a loss of 1 cent, at $68.21 and One Caribbean Media lost $3 to close at $22 while trading 10,000 shares. Firm Trades| Stocks closing with prices unchanged at the end of trading are, ANSA McAL contributing 1,382 shares and closed at $66.50, Clico Investment Fund posted 1,000 shares but remained at $23.50, Grace Kennedy traded 18,314 to end at $3.65, Guardian Media traded 957 shares at $19.75. Scotiabank finished with 170 shares changing hands at $62, Trinidad Cement added 33,820 shares valued at $84,542 and L.J. Williams B share, traded 29,050 units at $1. IC bid-offer Indicator| At the end of trading the Investor’s Choice bid-offer indicator showed 3 stocks with the bid higher than their last selling prices and 2 stocks with offers that were lower. In trading on the Trinidad Stock Exchange, Scotiabank climbed to $62 to be the stock with the highest gain at the close. 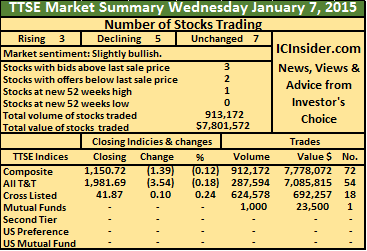 Trading resulted in 18 securities changing hands, at the close on Tuesday, of which 4 advanced, 4 declined and 10 traded firm, with a total of 385,169 units, valued at $8,973,527 trading. At the close of the market, the Composite Index rose 1.04 points to close at 1,152.11, the All T&T Index rose fell by 1.86 points to close at 1,985.23 and the Cross Listed Index increased by a 0.03 points to end at 41.77. Gains| Stocks increasing in price at the close are, ANSA McAL traded 4,098 units at $66.50 while gaining 5 cents. Jamaica Money Market Brokers added 27,400 shares at 44 cents to gain a cent, National Flour with 11,495 shares advanced by 2 cents to end at $1.18 and Scotiabank jumped 48 to end the day at $62 with 3,264 shares changing hands. Declines| The stocks declining at the end of trading are, First Citizens Bank lost 4 cents in trading 20 shares and closed at $37.03. Massy Holdings with 95,095 shares traded for $6,487,335, closed at $68.22 with a 1 cent loss, National Enterprises had 773 shares changing hands at $17.42, down a cent and Readymix with 156 shares traded at a loss of 1 cent to close at $18.79. Firm Trades| Stocks closing with prices unchanged at the end of trading are, Agostini’s exchanged 288 shares at $17.50 each, Ansa Merchant Bank traded 200 shares at $39.45, Clico Investment Fund traded 59,367 shares valued at $1,395,125, to close at $23.50, Guardian Holdings traded 8,008 shares to close at $13.25. Guardian Media closed with 652 units trading at $19.75. 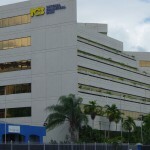 National Commercial Bank with 105,000 shares changing hands for a value of $120,800 and ended at $1.15, One Caribbean Media closed at $25 with 5,031 units trading, Point Lisas Industrial Port with 2,500 shares ended at $3.75, Sagicor Financial Corporation traded 8,970 shares to close at $5.95 and Trinidad Cement contributed 52,852 shares with a value of $132,130 to close at $2.50. IC bid-offer Indicator| At the end of trading the Investor’s Choice bid-offer indicator had 4 stocks with the bid higher than their last selling prices and 1 stock with the offer that was lower. Trading on the Trinidad Stock Exchange ended on Monday with 12 securities changing hands of which 1 advanced, 1 declined and 10 traded firm with a total of 274,838 units, valued at $2,171,817. At the close of the market, the Composite Index rose 0.06 points to close at 1,151.07, the All T&T Index gained 0.11 points to close at 1,983.37 and the Cross Listed Index remained at 41.74. Gains| The only stock to gain in price at the close, is ANSA McAL as it traded 1,200 shares and increased by 5 cents to end at $66.45. Declines| Massy Holdings was the sole stock declining at the end of trading, with 3,430 shares to close at $68.23, after declining by 3 cents. Firm Trades| Stocks closing with prices unchanged at the end of trading are, Ansa Merchant Bank with 1,823 shares closed at $39.45, Clico Investment Fund with 51,494 shares valued at $1,209,543 to end at $23.50, Firstcaribbean International Bank contributed 4,870 shares to close at $5, First Citizens Bank traded 2,171 shares at $37.07. Flavorite Foods traded 615 units to close at $4.80 while Guardian Holdings traded 4,515 shares at $13.25, National Commercial Bank with 110,500 shares changing hands for a value of $127,095, closed at $1.16, followed by National Enterprises with 3,080 shares at $17.42. Point Lisas Industrial Port Development with 312 shares, ended at $3.75 and Trinidad Cement with a volume of 90,828 shares traded for $227,070 to close at $2.50. IC bid-offer Indicator| At the end of trading the Investor’s Choice bid-offer indicator had 4 stocks with the bid higher than their last selling prices and 2 stocks with offers that were lower. West Indian Tobacco traded 122,699 shares with a value of $14,888,215 for the largest trade on Friday. Trading on the Trinidad Stock Exchange started 2015 on a positive note with First Citizens Bank and West Indian Tobacco traded heavily. 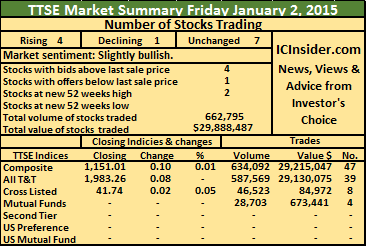 The market closed with 12 securities changing hands of which 4 advanced, 1 declined and 7 traded firm, with a total of 662,795 units, valued at $29,888,487 trading. At the close of the market, the Composite Index rose just 0.10 points to close at 1,151.01, the All T&T Index rose by a mere 0.08 points to close at 1,983.26 and the Cross Listed Index increased by 0.02 points to 41.74. Gains| Stocks increasing in price at the close are, Clico Investment Fund, posting a gain of 43 cents, to end at $23.50, for a new 52 weeks’ high, with 28,703 shares trading at $673,441. First Citizens Bank with 375,312 shares changing hands for a value of $13,912,734 to close with a gain of 1 cent at $37.07, Unilever Caribbean traded 1,050 shares at $64.51 with a gain of 1 cent and West Indian Tobacco with a volume of 122,699 shares traded for $14,888,215, ended at $121.34, up by a cent. Declines| Guardian Media suffered a fall of 2 cents to end the day at $19.75 with 3,397 shares trading and was the sole stock falling. IC bid-offer Indicator| At the end of trading the Investor’s Choice bid-offer indicator showed 4 stocks with the bid higher than their last selling prices and 1 with the offer lower. 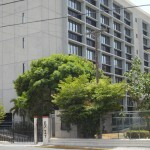 The Trinidad Stock Exchange ended 2014 on a winning note, on the final trading day, but the market closed the year with a loss in the three indices, compared with their opening in January. On the final day of trading for the year, 11 securities changed hands of which 3 advanced, none declined and 8 traded firm with a total of 231,234 units, valued at $2,649,788 changing hands. At the close of the market, the Composite Index rose 4.19 points to close at 1,150.91, the All T&T Index rose by 0.11 points to close at 1,983.18 and the Cross Listed Index increased by 1.10 points to end at 41.72. For the year, the Composite Index declined by 34.14 points or 2.88 percent to close at 1,150.91, the All T&T Index declined 10.54 points to 1,983.18 and the Cross Listed Index declined by 7.71 points or 15.59 percent to close at 41.72. Overall Market activity resulted in 35 stocks trading of which 20 advanced, 14 declined and 1 traded firm. Gains| Stocks increasing in price at the close are, Firstcaribbean International Bank gained 25 cents to end the day at $5 while trading 5,730 shares. L.J. Williams B shares contributed 44,000 units and gained of 10 cent to a new 52 weeks’ high of $1 and Scotiabank traded 117 shares valued at to close with a gain of 2 cents to end at $61.52. Declines| There was no declining stocks at the end of trading on the final trading day for 2014. Firm Trades| Stocks closing with prices unchanged at the end of trading are, First Citizens Bank traded 4,898 shares valued at $181,520 to close at $37.06, Jamaica Money Market Brokers had 102,778 shares changing hands at 43 cents, Massy Holdings traded 2,591 shares valued at to close at $68.25. National Enterprises traded 50 shares at $17.42, National Flour with 6,000 shares trading, closed at $1.15, Sagicor Financial Corporation traded 147 shares at $5.95, Trinidad Cement traded 48,122 shares valued at $120,305 and ended at $2.50 and West Indian Tobacco added 16,801 shares valued at $2,038,430 and closed at $121.33. IC bid-offer Indicator| At the end of trading the Investor’s Choice bid-offer indicator had 2 stocks with the bid higher than their last selling prices and 1 stock with the offer that is lower. Trading on the Trinidad Stock Exchange closed with 14 securities changing hands of which 1 advanced, 2 declined and 11 traded firm with a total of 486,178 units, valued at $21,228,614 being active. At the close of the market, the Composite Index lost 0.17 points to close at 1,146.72, the All T&T Index closed unchanged at 1,983.07and the Cross Listed Index fell 0.05 points to end at 40.62. Gains| Clico Investment Fund with 19,810 shares valued at $456,913 climbed 3 cents to $23.07 to be the only stock rising and ended at a new 52 weeks’ high. Declines| The stocks declining at the end of trading are, Jamaica Money Market Brokers 103,643 shares with the price falling 1 cent 43 cents and Republic Bank with 147,666 shares changing hands for a value of $17,681,527, to close at $119.74 for a 1 cent decline. Firm Trades| Stocks closing with prices unchanged at the end of trading are, Agostini’s with 190 units changing hands, closed at $17.50, First Citizens Bank traded 13,248 shares valued at $490,971 to close $37.06, Guardian Holdings ended with 500 shares trading at $13.25, National Commercial Bank added 33,550 shares at $1.15, National Enterprises traded 10,439 shares at $17.42. National Flour Mills traded 500 shares at $1.15, One Caribbean Media with 13 shares ended at $25 followed by Sagicor Financial Corporation that traded 366 shares and closed at $5.95. 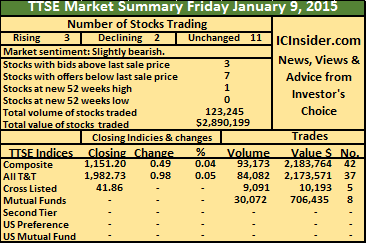 Scotiabank traded 2,342 shares at $61.50, Trinidad Cement with a volume of 138,825 shares traded for $346,497 ended at $2.50 and West Indian Tobacco with 15,086 shares valued at $1,830,384 closed at $121.33. Scotiabank closed up 50 cents on Monday to $61.50 as the price continues to recover. Trading on the Trinidad Stock Exchange ended on Monday with 13 securities changing hands, 7 advanced, 1 declined and 5 traded firm with a total of 172,532 units, valued at $724,685 traded. At the close of the market, the Composite Index rose 1.57 points to 1,146.89, the All T&T Index gained 3.48 points to end at 1,983.07 and the Cross Listed Index increased by a mere 0.04 points to end at 40.67. Gains| Stocks increasing in price at the close are, Agostini’s in trading 460 shares advanced 16 cents to end at $17.50. 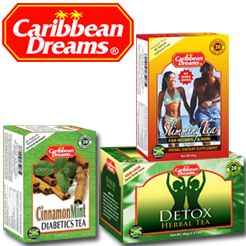 Angostura Holdings added 5,180 shares to close at $3.50 while gaining 20 cents, Clico Investment Fund traded 250 shares and advanced by 2 cents to $23.04, First Citizens Bank traded 2,000 shares to close with a gain of 1 cent at $37.06, Jamaica Money Market Brokers with 100,000 shares changing hands gained 1 cent to end at 44 cents, Massy Holdings traded 50 shares to close with a gain of 25 cents at $68.25 and Scotiabank gained 50 cents to end at $61.50 while trading 980 shares. Declines| Grace Kennedy lost 10 cents while trading 40,000 shares to end at $3.65 and was the sole stock to fall in price. Firm Trades| Stocks closing with prices unchanged at the end of trading are, Ansa Merchant Bank that traded 5,000 units to close at $39.45. Sagicor Financial Corporation contributed 17,722 shares with the price closing at $5.95, Scotia Investments had 318 shares changing hands at $1.45, Trinidad Cement contributed 500 shares to end at $2.50 and West Indian Tobacco exchanged only 72 units at $121.33. IC bid-offer Indicator| At the end of trading the Investor’s Choice bid-offer indicator showed just 1 stock with the bid higher than the last selling price and none with the offer that was lower.